The birds… the birds is coming! Those fateful words, spoken by Cathy in Hitchcock’s seminal horror-thriller — The Birds. 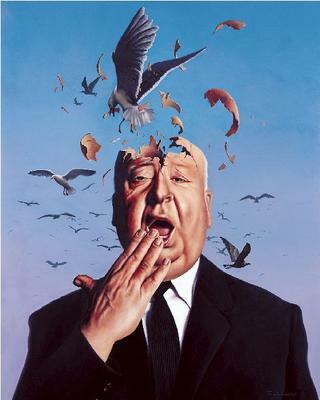 When it was originally advertised it inspired angry letters from school teachers all over the States, as it quite quirkily stated “The Birds Is Coming” — a lot of media experts put down the success of this film to the grammar ‘error’ that caught the attention of the masses. Of course, ‘The Birds’ refers to the film, which is singular… but still! Anyway, I said I would tell the tale of the goose, and so here I am, at long last. 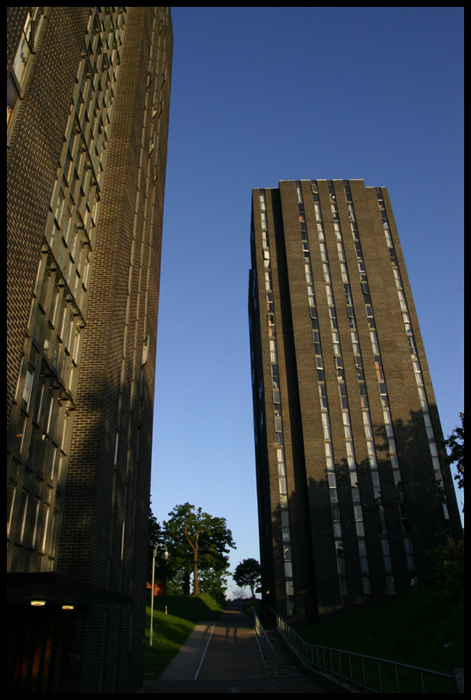 At the University of Essex, most of the on-campus accomodation was in the form of big, black, f*ck-off towers. The original idea behind these was that there’d be something like 25 of them, each one some kind of ‘European community’ — there’d be a British tower, a French tower… and so on. You know, the standard post-modernistic/globalisation ideas from the 60s and 70s. One big happy family. Sadly, they ran out of money after building 6 of these black brick monstrosities. And they’re listed buildings too, which means they can’t ever be torn down… A blight upon the cityscape, for EVER! Each tower had between 14 and 16 floors — all self-contained flats. With only 2 showers, I might add, which posed a problem in the morning. And only two small fridges too. These were well and truly the ghettos of on-campus accomodation — but cheap, which is why a lot of people wanted to live there. To get our own back, we devised a master plan, involving a goose, and mayonaise. Now, most of you are probably thinking ‘Yeah, a dead goose from the supermarket, covered in mayonaise would be pretty scary.’ Such a childish prank wasnt’ going to be good enough for us, no siree. The university had a lake, with a lot of ducks and geese, you see. So, in the middle of the night, while everyone was asleep, we snuck down to the lake. Did you know that ducks and geese ALSO sleep? We didn’t… And they were all asleep on an island in the middle of the lake. Me: whispering. So who can imitate a goose call? Sarah: Why are you whispering if we’re going to have to wake them up? Aaron gave it his best shot, and before we knew it, a fleet of geese were swimming across the lake towards us — I guess their eyesight isn’t any better than ours, because the noise only sounded vaguely like a goose… in distress… with constipation. Now came the hard bit, which we’d thought about, but hadn’t really decided on — how do you catch a big goose that can (apparently) bring your finger, if it gets a good grip? Aaron tried chasing one, without much success. Me, I went for the duvet-over-the-head technique, which worked a whole lot better. Now we’re stumbling back to the Onyx Tower (Orthanc, anyone? ), a goose held between us inside a duvet. He’s struggling quite a lot. We stop by at Flat 4 quickly, to grab the industrial catering-sized vat of mayonaise. We ride the lift slowly down two floors and sneak into their flat, with a key we’d appropriated a few days before. Quickly, we lather their entire kitchen floor with mayonaise, dump the angry goose, and scarper before anyone wakes up and catches us in the act. To this day, I like to think we traumatised 16 people for the rest of their collective lives. I like to think they’re now afraid of geese, and eat it at Christmas whenever the chance arises. The bullying stopped soon after that, too. Incidentally, try filling condoms up with mayonaise and throwing them from the top of a 16-storey building. Anyway, as this is kind of ‘Duck Day’ (it sounds better than ‘Swan Saturday’), I have a couple of links to richen the whole thing. First, the truck driver that has a pet duck. I think they call these ‘human interest’ stories. I think it’s more ‘how sanity is slipping away from people that have everything in the Western World’… but I guess that wouldn’t go down so well in a news program. Secondly, I have a great video from TED, on the crazy intelligence of crows. TED’s amazing, by the way, if you’re a geek (or just an interested intellectual) that wants to know where the bleeding edge of technology is, or perhaps some new, funky applications of existing ‘Technology, Entertainment & Design‘. There, I told the bird story. geniusness, now that sounds like a guy who cant take craps from anybody. Maybe I should stop bullying people. Tell me a story from YOUR time at university! Wow, I am sooo impressed that you would carry a deadly goose under your arm! How did the story end?How did they handle the goose/mayo combo? Andari – you’ve seen the stories of those Americans that have floated away in chairs, with hundreds of helium balloons…? I like to think the goose made it out safely. Security probably gathered it from the flat the morning after. I can’t condone cruelty to animals, and stuff. I don’t know why, but I love those towers almost as much as I love TED. If they ever do get pulled down I will be most displeased.